I’ve written a series of novels exploring the idea of technology that could bug a person’s brain. Whilst watching an interview with Edward Snowden, I wondered how life would be if there could be no secrets. I wanted to explore the idea of a sort of ultimate Wikileaks World. The future England I imagined has ‘audiopt’ technology that can intercept your brain’s optic and auditory nerve signals and so display on a computer screen everything you see and hear. Following a global meltdown of civil wars, known as The Times of Malthus, the remaining global population of less than 100 million decide to implement this technology and – here’s the kicker – publish the feeds publicly on the internet. So the series of novels explores how society takes to this new way of living. 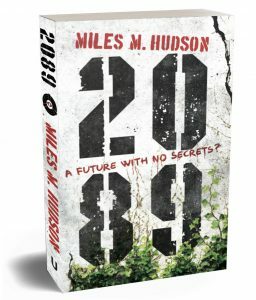 The first book in the series is 2089, click for more details, or you can start reading it for free by clicking the image of the book. You can find out more, and order copies, at the publishers website: Unbound.